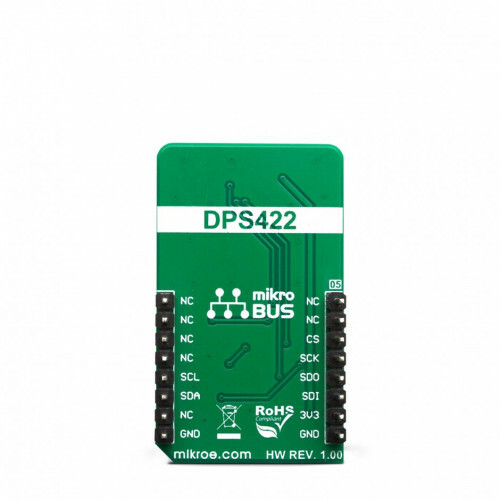 The DPS422 is designed with the low-power consumption in mind, has a very small size, and requires a low number of external components. These features make the DPS422 a perfect choice for an IoT or battery-powered application. 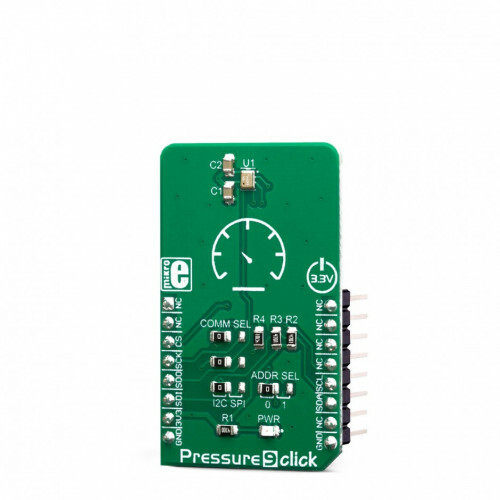 Therefore, Pressure 9 click can be used as a tool for development of various pressure-based IoT applications, as well as other applications where the power consumption and constrained space could be a problem: portable weather stations, room temperature control, applications related to elevation gain and vertical speed detection, sports-related wearables, and similar. 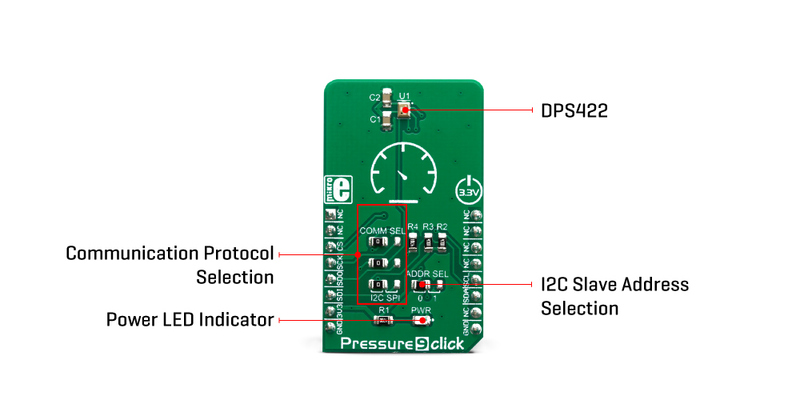 Pressure 9 click features the DPS422, a digital barometric air pressure sensor, by Infineon. It can be used to measure absolute pressure values from 300 to 1200hPa. The sensor contains a highly accurate capacity-based Micro Electro-Mechanical Sensor (MEMS), along with a high resolution 24-bit sigma-delta A/D converter (ADC). The MEMS also features a set of factory calibration parameters, stored into its OTP memory. They allow high-precision pressure and temperature data conversions to be performed, enabling results in physical units. By adjusting the oversampling ratio, the developer can find a perfect balance between the accuracy, speed (output data rate), and power consumption, in accordance to the application requirements. MEMS consists a set of tubular vacuum cells, covered by membranes. By applying a pressure, capacitance of the cell is changed proportionally. Several vacuum cells are connected in parallel, allowing for better sensitivity and less noise. The capacitance of the cells is measured and converted to a voltage which is sampled by the internal 24-bit ADC. The result is available over I2C or SPI interface, depending on the position of the COMM SEL jumpers. The conversion formula is then applied to the raw result value, providing pressure and temperature values in human readable format. 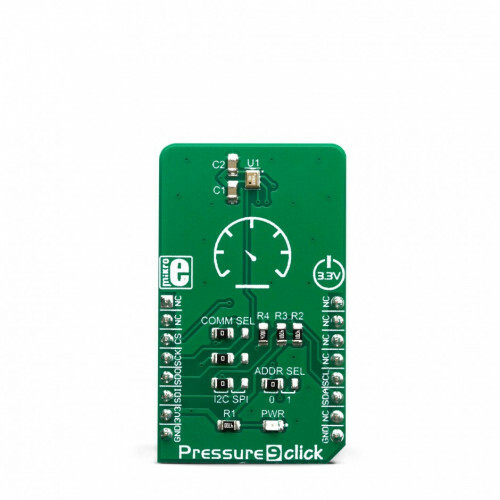 Pressure 9 click supports both SPI and I2C communication interfaces, allowing it to be used with a wide range of different MCUs. The communication interface can be chosen by moving SMD jumpers grouped under the COM SEL to an appropriate position (SPI or I2C). 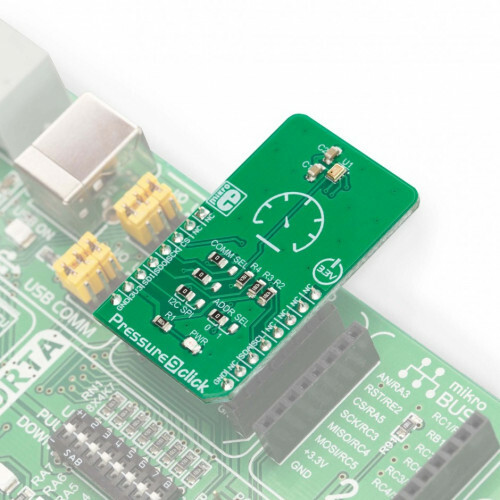 The slave I2C address can also be configured by a SMD jumper, when operated in the I2C mode: a SMD jumper labeled as ADD SEL is used to set the least significant bit (LSB) of the I2C address. When set to 0, the 7-bit I2C slave address becomes 0b1110110x. If set to 1, the address becomes 0b1110111x. The last digit (x) is the R/W bit. Please note that each jumper should be moved to the same position, else the communication with the host MCU may not be possible. One of distinctive features of the DPS422 is the FIFO buffer with 32 slots, allowing to buffer both pressure and temperature readings. The FIFO buffer can be used as a temporary storage for the incoming data, allowing for reduced data traffic through the communication bus. The FIFO buffer can be very useful for writing an optimized MCU firmware. The least significant bit (LSB) of the result stored within the FIFO buffer, determines if the stored data represents pressure, or temperature (1 is used for pressure, 0 for temperature). A bit within the FIFO status register indicates if the buffer is full or if the watermark level has been reached. The FIFO buffer can also be disabled, allowing data to be fetched from the output registers, directly. Pressure and thermal data are available at the output, in 24-bit, two’s complement format. To convert the raw data into a human-readable format, the firmware of the host MCU has to obtain the calibration data. Calibration coefficients are then used within pressure or temperature conversion formulas. The required formulas can be found within the datasheet of the DPS422. However, this Click board™ comes with the mikroSDK compatible library of functions that simplify the firmware development. The developer is able to use simple function calls, which perform all the necessary data conversion, returning the pressure and thermal data in human readable format. Applications A perfect tool for development of various pressure-based IoT applications, as well as other low-power and space-constrained applications: portable weather stations, room temperature control, applications related to elevation gain and vertical speed detection, sports-related wearables, and similar. On-board modules DPS422, a digital barometric air pressure sensor, by Infineon. Key Features 24-bit conversion, high precision, low power consumption, low count of external components required, both pressure and temperature data, factory programmed calibration parameters, perfect for IoT based applications. This table shows how the pinout on Pressure 9 click corresponds to the pinout on the mikroBUS™ socket (the latter shown in the two middle columns). 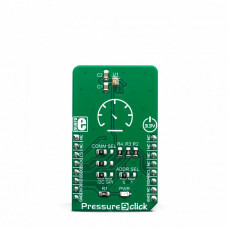 We provide a library for the Pressure 9 click on our LibStock page, as well as a demo application (example), developed using MikroElektronika compilers. The demo can run on all the main MikroElektronika development boards. The library initializes and defines the I2C or SPI bus driver and drivers that offer a choice for writing data in register and reads data form register. The library includes function for read Pressure data in mBar and Temperature data in C. The user also has the function for update all calibration coefficients, function for configuration register and functions for get Pressure and Temperature raw data. float pressure9_getTemperatureData() - Temperature data. float pressure9_getPressureData() - Pressure data. void pressure9_updateCalculationCoefficient() - Update all calibration coefficients. System Initialization - Initializes I2C or SPI module and sets CS pin as OUTPUT for select comunication. Application Initialization - Initialization driver init, test comunication, software reset, configuration module for measurement and calls the function to update calibration coefficients - this function must be called before the measurement starts. Application Task - Reads Temperature data in [C] and Pressure data in [mBar] and this data logs to the USBUART every 1 sec.